The 2018 CAMS Australian Rally Championship will be decided on the final day of competition at Kennards Hire Rally Australia. It was another day of twists and turns at the sixth and final round of the ARC in Coffs Harbour, with mixed fortunes for the three remaining title contenders, Eli Evans, Harry Bates and Steve Glenney. Championship leader Evans, with co-driver Ben Searcy, burst out of the blocks this morning, winning the first two stages of the day. 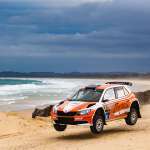 However the pair’s fightback was temporarily derailed when they hit a rock and suffered a puncture on SS10, losing more than a minute to outright leader Bates. Bates and co-driver John McCarthy hit back, fastest on SS11 and SS12, and led today’s leg by more than a minute and the event by three minutes at the midday service. But the rollercoaster that is Rally Australia continued, with the Yaris AP4 stopping on SS14 with a mechanical issue, putting an end to the Toyota Gazoo Racing Australia crew’s day. The Neal Bates Motorsport team were assessing the engine issue overnight to make a decision on rejoining for day three. Contel Communications’ Steve Glenney and Andy Sarandis did not escape unscathed from the morning’s dramas. They too found the going rough on the Urunga stage, clipping a stump with the rear of the Skoda Fabia R, breaking a wheel rim. Glenney limped to the end of the stage, also losing valuable time. Finding some rhythm late in the day, Glenney claimed three stage wins for the afternoon, handing him the leg two win and the outright event lead. “The drama never ends, it’s just ridiculous…. what’s going to happen next?” Glenney said of the day’s action. With another day familiarising himself with the Skoda, Glenney admitted to feeling much more comfortable. Evans was in good spirits this afternoon, happy to be back in the box seat for the Championship – second in leg two. “We’re going pretty good, we just knicked a rock so that hurt us a little bit…. Steve’s had issues as well so we are a little bit in front of him… we’ll keep at it,” Evans said. While the title contenders were riding the ups and downs, several less-experienced campaigners produced some stellar drives. Rookie Luke Anear and co-driver Jon Mitchell have put in a near faultless performance to be sitting second outright at the end of day two, but more than seven minutes behind Glenney. Rally Australia is only Anear’s third gravel rally event and Mitchell is more at home on tarmac. “It was pretty interesting through Welshes Creek, fast and flowing, and then into narrow bridges and all the people on the sides with flags and stuff so it’s pretty crazy,” said Anear. Queensland young gun Wayne Morton continues to impress, pushing his Toyota Corolla S2000 to the limit, holding down third outright. “We’re slowly finding the rhythm and getting a bit faster,” Morton explained. Also in a Corolla S2000, Lewis Bates recovered well from yesterday’s retirement to claim third for leg two. In ARC2, Andrew Penny continues to lead the winner-takes-all final in his Subaru WRX STi, followed by Kevin Raedel in the Ford Falcon. Kennards Hire Rally Australia concludes tomorrow, with competitors taking on a final six stages anymore than 80 competitive kilometres. The event will conclude with a podium presentation at the end of the final Wedding Bells stage.